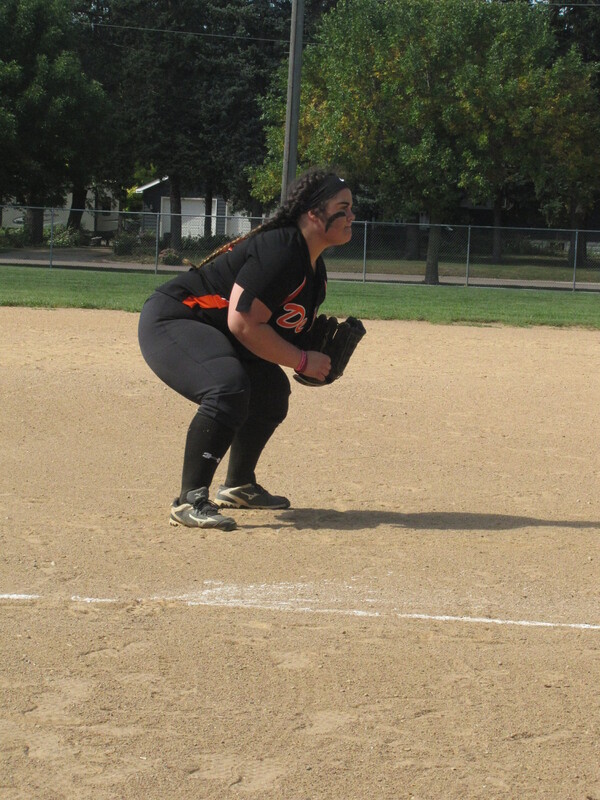 The Dell Rapids Club Softball varsity team dropped its final two games of the season on Sunday, September 30th in Tea. Dell Rapids fell to Tea 14-11 in their first game of the day and then lost to Pipestone 12-7 in the second game. Slow starts in both games ended up being the difference as the come-from-behind rallies fell short in both games. Hannah Heiberger finished the day with seven hits in seven at bats that included a double, four RBIs, and two runs scored. Heiberger also caught the first game and did not allow a stolen base. Zoe Mortrude had four singles, two walks, an RBI, and four runs scored during the day. Brooke Klein added a single, a double, a triple, two walks, and an RBI. Dell Rapids will now play in the state tournament on Saturday, October 6th and Sunday, October 7th. Dell Rapids has earned a first round bye and will play the winner of Aberdeen vs Tea at 11:00 a.m. on Saturday in Sioux Falls. 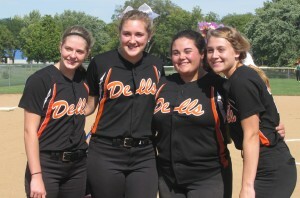 The Dell Rapids varsity softball team hosted games against Pierre and Brookings on Sunday, September 23rd. The two games were the final two home games of the season, and the seniors were recognized during the day. This year’s seniors are Elly Schultz, Alexis Ehrmentrout, Ashlee Lambert, and Brooke Klein. Dell Rapids’ first game of the day was against Pierre. Pierre took a close one from Dell Rapids by a score of 8-6. Dell Rapids then played Brookings and led the entire game until a g0-ahead home run for Brookings in the bottom of the least inning stole a 13-12 victory. Sam Price helped lead the team all day with three singles, a double, two runs scored, and two RBIs. Price also shared pitching duties in both of the games during the day. Lambert had two singles, three walks, and two runs scored in the two games. Hannah Heiberger finished the day 3-3 with three singles, two RBIs, and two runs scored. Ehrmentrout had two doubles in the game against Pierre with a run scored and three RBIs. Dell Rapids (5-3) will travel to Tea on Sunday, September 30th to play games against Tea and Pipestone. The Dell Rapids JV team also had two games on Sunday suffering losses to Pierre, 5-15, and to Tri-Valley, 8-16. Alexyss Ladeaux had three doubles and a run scored. Michaela Witte was 4-4 with four singles and three runs scored. Rhaegyn Peterson had two doubles, a single, and a run scored. These were the final regular season games for the JV team, and their season record ends at 1-7. Dell Rapids JV will play in the JV state tournament at Sherman Park in Sioux Falls September 29th-30th. 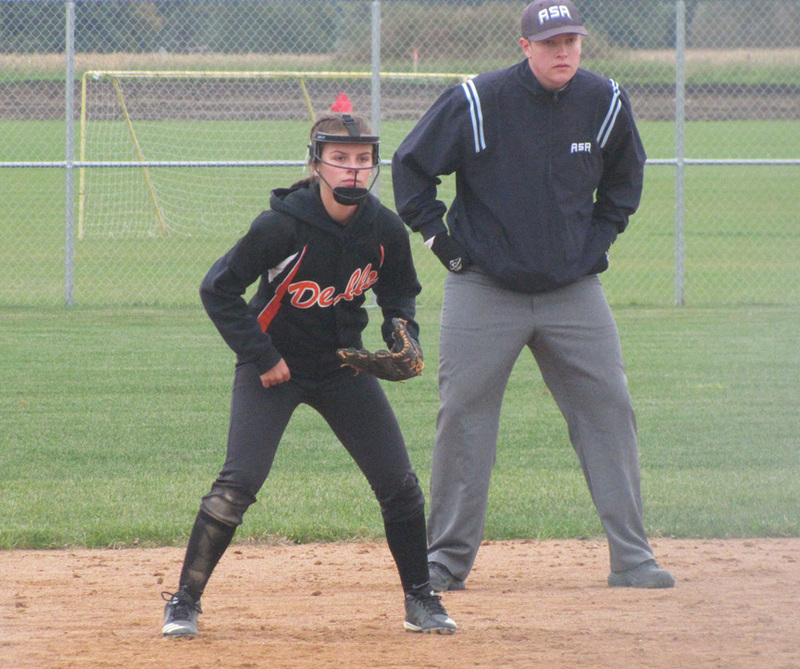 The Dell Rapids softball team won their fourth and fifth games in a row after taking two games from Lennox on Sunday, September 16th. Dell Rapids defeated Lennox 9-7 in the first game and then 5-1 in the second game of the afternoon. Ashlee Lambert, Hannah Heiberger, and Elly Schultz all had three hits each on the afternoon. Zoe Mortrude had a good defensive day and was also 1-3 with a single, two walks, an RBI, and two runs scored. Alexis Ehrmentrout was 3-5 at the plate with two singles, a double, a walk, and two runs scored. Kyra Wajer had a three-run double during the day. Wajer and Sam Price shared the pitching duties in the two games, each earning a win. They combined for a total of nine strikeouts in the two games. Dell Rapids (5-1) will host their final two home games on Sunday, September 23rd. Dell Rapids will play Brookings as 12:30 and then Pierre at 3:30. Brookings will play Pierre at 2:00 p.m. There will also be four JV games during the day. Dell Rapids JV will play Tri-Valley at 11:00 a.m, Tri-Valley will play Brookings at 12:30 p.m., Brookings will play Pierre at 2:00 p.m., and the final JV game will be Dell Rapids vs Pierre at 3:30 p.m. The JV team also played two games in Lennox on Sunday. Dell Rapids fell to Lennox 4-8, but earned their first with of the year with an 11-9 win against the Sioux Stars. Cora Alderson had four singles and a run scored. Alderson also pitched all but one inning of the two games. Audriana Uriquo had four hits and three runs scored. Ashlynn Trewin had three singles, a double, and two runs scored. Alexyss Ladeaux hit a double during the day. Rhaegyn Peterson had a big two-run home run in the top of the last inning to take the lead in the win over the Sioux Stars. Dell Rapids Softball played a double header on Field E in Dell Rapids on Sunday September 9th. Dell Rapids swept Baltic/Chester/Flandreau (BCF) in a double-header by scores of 13-6 and 6-4. In a combined 45 at bats, the team had 11 hits, seven walks, and just seven strike outs. Senior Brooke Klein finished the day with two doubles, a triple, a single, and two walks along with three RBIs and five runs scored. Klein also had several key defensive plays in center field. Senior Ashlee Lambert had three singles, two walks, an RBI, and four runs scored. Lambert was also strong defensively at first base. Senior Alexis Ehrmentrout scored two runs in four at bats with two singles and a double. Senior Elly Schultz added to the excitement with a two-run home run in the first game. Samantha Price and Krya Wajer shared pitching duties with each earning a win for the day. The Dell Rapids Varsity has a season record thus far of 3-1 with their only loss coming in the season opener to Vermillion. The Junior Varsity also played games against Watertown and Canton on Field F during the day, suffering losses of 5-15 and 9-13 respectively. In a combined 42 at bats the team had 15 hits, 11 walks and just two strike outs. Freshman Audriana Uriquo led the day with five singles and two runs scored. Sophomore Cora Alderson pitched all but two innings on the day and was solid at the plate earning two runs in four at bats with three walks and a single. The young JV squad has a season record thus far of 0-4, but is improving from week to week learning the new system. The Dell Rapids Fall Softball program has grown significantly over the last few years with player numbers. This year over 50 middle school and high school players are playing for Dell Rapids. Next week both teams travel and play in Lennox with games starting at 12:30. The next home games will be a big day of seven total games on Sunday, September 23rd. Varsity squads from Brookings and Pierre along with Junior Varsity squads from Brookings, Pierre and Tri-Valley will come to Dell Rapids for games. 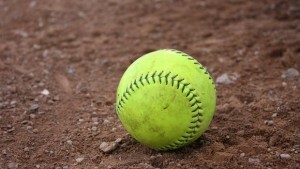 Plan to attend for what’s sure to be some great softball action! 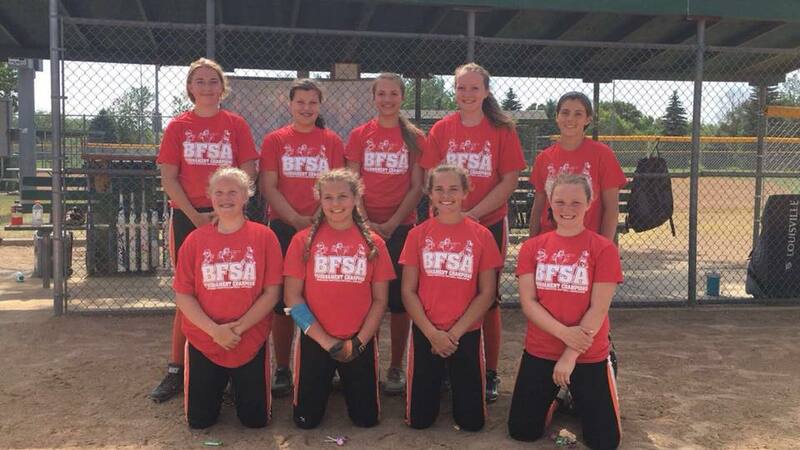 On the weekend of June 8th, the Dell Rapids Q’s played in the Brookings Softball Tournament and took 1st place in the U14 Division. They played pool play games and were in 1st place after those games. They continued with the tournament and defeated Winner for the championship. Dell Rapids was led in pitching by Kylie Bittner and Autumn Tomes. Bittner pitched the first game of the tournament which was a no hitter! Bittner ended the weekend with 13 strike outs while pitching two games. Tomes pitched three games and had 18 strike outs. Leading Dells in stolen bases was Abby Greenhoff with nine, Rileigh Foster with eight, Haileigh Barnhart and Jacee Tebay with seven, and Bittner and Kenzie Garry with six. Leading the hitting over the weekend were Bittner with the batting average of .833, Garry with a .700 average, and Greenhoff, Tomes, Cara Rice, and Tebay with a .667 average. Makayla Duinkerken and Garry hit home runs in the tournament! 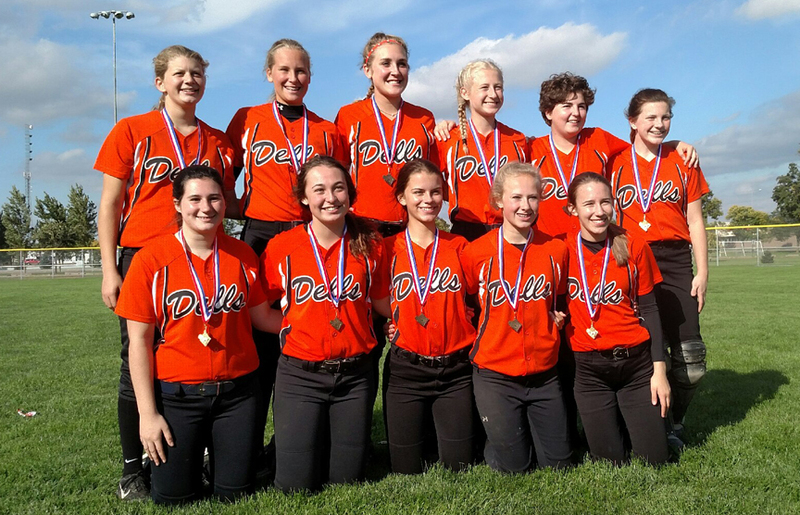 The Dell Rapids softball team finished 2nd at the 2017 South Dakota JV State B tournament held Saturday, September 30th through Sunday, October 1st in Sioux Falls. Fourteen teams competed the tournament. Dell Rapids played four games on the first day of the tournament. Their first game was a 15-7 win over Sturgis. The girls rallied in their second game against Watertown. After falling behind 8-0, Dell Rapids earned a 16-13 come-from-behind win to advance in the tournament. Dell Rapids kept the momentum rolling and won their third straight game, this time an 11-5 win over Garretson. Dell Rapids was handed their first loss in their last game of the day against Madison by a score of 8-2. After a two-hour rain delay to start the day on Sunday, Dell Rapids won their first game of the day against Pierre by a score of 10-2. The win sent Dell Rapids to the Championship game for a rematch with Madison. Madison, however, defeated Dell Rapids again, this time 9-2, to give Dell Rapids the second place finish. Dell Rapids scored a total of 56 run on 57 hits in the tournament. The hit total included three doubles, five triples, and four home runs. The team also took at total of 35 walks in their six games. Some of the offensively leaders for Dell Rapids included Hannah Heiberger who hit two home runs against Garretson. 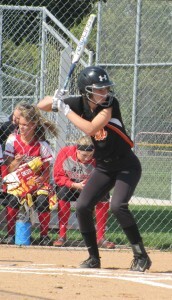 Elly Schultz also hit a home run against Garretson. Maddy Wilber had a home run against Watertown. Rhaegyn Peterson and Cora Alderson both had nine hits each for the tournament and also led the team in on base percentage. Kyra Wajer pitched all but three innings of the tournament for Dell Rapids.